Three band students from Ooltewah High School have been chosen to attend prestigious summer programs. All three students underwent a thorough application process as well as a competitive audition process to be chosen for these programs. 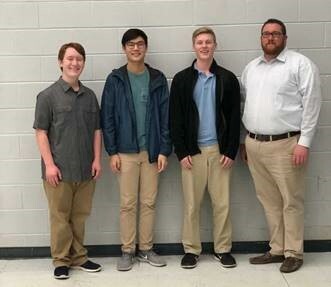 Logan Henson and Ian Tran, both juniors at Ooltewah High, were chosen for Tennessee Governor’s School for the Arts, a summer program for juniors and seniors that gives students the opportunity to learn from some of the best professionals from around the world. The six-week program helps each student explore and develop his or her talents in music, ballet, theatre, filmmaking, and visual art. Mr. Henson plays the horn and will receive a full scholarship. Mr. Tran plays the flute and will receive a partial scholarship. Mr. Henson possesses a 4.0-grade point average, is a member of the National Beta Club, and has recently been elected to the National Honor Society. He has participated in All-County Band, ETSBOA Senior Clinic, Lee University Honor Band, and All-State Band. Mr. Henson is a member of the Chattanooga Symphony Youth Orchestra, and he marched in the Tournament of Roses Parade in 2016. Mr. Tran is enrolled in AP courses, treasurer of the Hoo Club at OHS, treasurer of the Science Olympiad, member of the Chattanooga Symphony Youth Orchestra and marched in the Tournament of Roses Parade in 2016. He has participated in ETSBOA Junior and Senior Clinic, and Lee University Honor Band. Sam White, a junior trumpet player at Ooltewah High, was chosen for the very competitive Interlochen Summer Arts Camp and High School Trumpet Institute at Interlochen. Located in northeast Michigan, this summer program is for students grades 3-12. Students from all around the world attend this program to study music, theatre, visual arts, creative writing, motion picture arts, and dance, as well as learn from amazing artists and educators and create with other students who share their passion for the arts. Mr. White is enrolled in AP and International Baccalaureate courses at Ooltewah High. He has participated in All-County Band, ETSBOA Junior, and Senior Clinic, Lee University Honor Band, and All-State Band. White is also a member of the Chattanooga Symphony Youth Orchestra and marched in the 2016 Tournament of Roses Parade.